Spain: Day 328 of 985 of the Spanish Civil War. UK: Britain places an order for 400 US airplanes. Germany: The main synagogue in Munich is demolished. Spain: Day 693 of 985 of the Spanish Civil War. CBI - China: Day 338 of 2,987 of the 2nd Sino-Japanese War. Day 123 of 124 of the Battle of Henan. UK: Winston Churchill urges the British government to form a military alliance with the Soviet Union. CBI - China: Day 703 of 2,987 of the 2nd Sino-Japanese War. CBI - Mongolia: Day 30 of 129 of the Battle of Khalkhin Gol, a border dispute between the Soviet Union and Japan. Atlantic: German sub U-46 sinks the Finnish ship MARGARETA 350 miles west of Cape Finisterre, Spain. The 19 survivors will remain adrift in a lifeboat for four more days before being rescued. ETO - Norway: Day 62 of 63 of the Battle of Norway. ETO - France: Day 31 of 44 of the Battle of France. German troops advancing south from the Somme capture Rouen on the Seine. The British and French units withdraw toward St-Valery-en-Caux, hoping to be evacuated to England. Meanwhile, the French government evacuates from Paris. CBI - China: Day 1,069 of 2,987 of the 2nd Sino-Japanese War. Day 208 of 381 of the Battle of South Guangxi. Day 40 of 49 of the Battle of Yichang. UK: The Fire Service Council is established in Britain, with 1,400 local brigades being merged into 32 regional ones. Atlantic: German sub U-46 sinks the British ship PHIDIAS in the North Atlantic. Later on in the same area, U-101 sinks the British ship TREVARRACK, whose 45-man crew in three lifeboats are never found. MTO - Italy: The Italian casualty figures for May are announced as 1,948 killed, 5,204 wounded and 27,292 missing. MTO - Libya: Day 61 of 256 of the Siege of Tobruk. Middle East: Day 2 of 37 of the Battle for Syria and Lebanon. The British advance 40 miles into southern Syria and Lebanon capturing Tyre in the process. East Africa: Day 365 of 537 of Italy's East African campaign in the lands south of Egypt. CBI - China: Day 1,434 of 2,987 of the 2nd Sino-Japanese War. Atlantic: Day 147 of 169 of Germany's Second "Happy Time," during which U-boats sink 609 Allied ships with little risk. Germany: The body of Heydrich lies in state in Berlin. Himmler calls him, "a noble, honest and decent human being." Russian Front - North: Day 275 of 872 of the Siege of Leningrad. Russian Front - North: Day 36 of 658 of the Siege of the Kholm Pocket. Russian Front - Center: Day 12 of 31 of Operation KREMLIN, a German diversion to trick the Soviets into thinking Moscow is their main objective instead of Stalingrad and the Caucasus. Russian Front - South: Day 223 of 248 of the Siege of Sevastopol, Crimean Peninsula. Both sides fight hard, yet neither gain any ground. MTO - Libya: Day 15 of 27 of the Battle of Gazala. Rations for the French Legionnaires, who had been cut off from the rest of the troops, are now down to a half cup of water per man per day, but they still hang on to their positions. East Africa: Day 36 of 186 of the Battle of Madagascar. CBI - China: Day 1,799 of 2,987 of the 2nd Sino-Japanese War. Day 26 of 124 of Japan's Zhejiang-Jiangxi Campaign, launched to punish anyone suspected of aiding the Doolittle raiders in China. Roughly 250,000 Chinese will be killed. PTO - Alaska: Day 3 of 435 of the Battle of Kiska, Aleutian Islands. A scout plane from the US 11th Air Force over Kiska and Umnak Islands discovers Japanese naval units in Kiska Harbor. PTO - Malaya: Day 111 of 357 of the Battle of Timor Island. PTO - Midway: The US Army Air Force tries to take part of the credit for the victory at Midway despite the fact that none of their land-based aircraft had sunk any Japanese warships. PTO - New Guinea: US 5th Air Force B-17s, B-25s and B-26s attack Lae and Salamaua. PTO - Philippines: All organized resistance against the Japanese invasion troops comes to an end. Russian Front - North: Day 640 of 872 of the Siege of Leningrad. Russian Front - North: Day 401 of 658 of the Siege of the Kholm Pocket. MTO - Yugoslavia: Yugoslavian partisan leader Josef Tito is wounded during a German air attack. MTO - Italy: Day 19 of 20 of the naval and aerial bombardment of Pantelleria Island. MTO - Italy: US 9th Air Force attacks targets in Sicily and on Pantelleria Island. MTO - Italy: US 12th Air Force keeps pounding various targets on Pantelleria Island. CBI - China: Day 2,164 of 2,987 of the 2nd Sino-Japanese War. US 14th Air Force damages a railroad bridge at Puchi. PTO: Day 14 of 47 adrift in a raft for the survivors of B-24 GREEN HORNET that crashed 850 miles from Hawaii. PTO - Alaska: Day 368 of 435 of the Battle of Kiska, Aleutian Islands. PTO - Japan: Just north off Oshima Island, the Japanese battleship MUTSU, crippled yesterday from a mysterious explosion, sinks a little after midnight. PTO - New Guinea: Day 49 of 148 of the 2nd Battle of Lae-Salamaua. US 5th and 13th Air Forces provide air support. PTO - Solomon Islands: US 13th Air Force attacks the airfields at Munda and Vila. Atlantic: During the 1-day Battle of Ushant, aka the Battle of Brittany, off the Brittany coast in France, the Royal Navy sinks a German destroyer and damages another ship, which is scuttled. ETO - France: Day 4 of 49 of Operation OVERLORD, the Allied invasion of Normandy, France, known forever simply as D-Day. D-Day+3: Allied Air Forces provide air support. Rommel puts all German troops in Normandy on the defensive. ETO - France: Day 4 of 62 of the Battle of Caen. The RAF flies from French airfields for first time since 1940. ETO - France: Day 4 of 25 of the Battle of Cherbourg. US troops from Utah Beach capture St Mere-Eglise and cut the crucial road and rail links on the Cherbourg peninsula. ETO - France: 99 civilians are hung from lampposts and balconies by German troops in Tulle in reprisal for maquisard French Resistance attacks. Russian Front - Finland: The Soviets set themselves for a major assault against Finnish troops on the Karelian Isthmus, just north of Leningrad. Russian Front - North: Day 129 of 191 of the Battle of the Narva Isthmus, Estonia. Both German and Soviet troops remain locked in their defensive positions. MTO - Italy: Day 5 of 16 of the Battle of the Trasimene Line (north of Rome). Allied Air Forces provide air support. US 5th Army and British 8th Army are now 50 miles northwest of Rome. MTO - Germany: US 15th Air Force B-17s and B-24s bomb targets at Munich. CBI - Burma: Day 97 of 166 of the UK's Operation THURSDAY. Monsoon season bogs down all operations. CBI - Burma: Day 92 of 147 of the Battle of Myitkyina. US 10th Air Force provides air support. Monsoon season bogs down all operations. CBI - Burma: Day 70 of 302 of the Chinese Salween Offensive. US 14th Air Force provides air support. Monsoon season bogs down all operations. CBI - China: Day 2,530 of 2,987 of the 2nd Sino-Japanese War. Day 54 of 259 of Japan's Operation ICHI-GO. CBI - India: Day 94 of 118 of the Battle of Imphal-Kohima. The Japanese frontal attack on Gurkha positions on Scraggy Hill is met with heavy losses, particularly to superior British firepower and air support. PTO - Caroline Islands: US 7th Air Force bombs targets in the Truk Atoll during the night. PTO - New Guinea: Day 14 of 83 of the Battle of Biak. 5th Air Force provides air support. PTO - New Guinea: Day 178 of 597 of the Battle of New Britain. US 13th Air Force provides air support. PTO - New Guinea: Day 49 of 481 of the Battle of Western New Guinea. 5th Air Force provides air support. PTO - Solomon Islands: Day 222 of 295 of the Battle of the Bougainville Islands. US 13th Air Force provides air support. 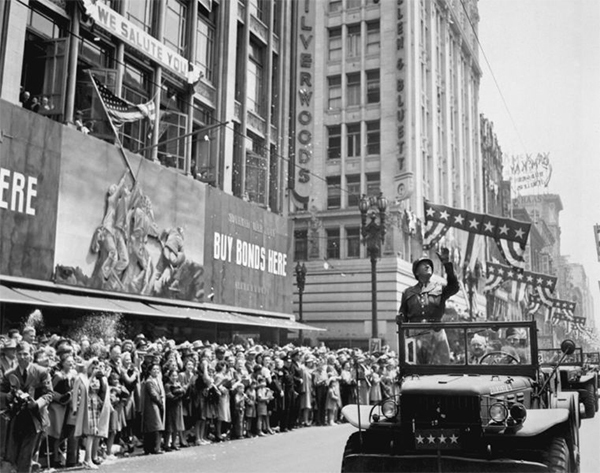 USA: General George S Patton and General James Doolittle are honored at a parade in Los Angeles, California. Patton speaks before a crowd of over 100,000 at the Los Angeles Memorial Coliseum, punctuating his speech with some of the same profanity for which he is famous. 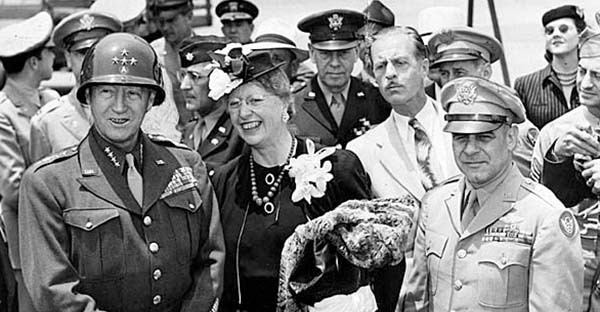 General George S Patton receives a warm reception when he and Army Air Forces Lieutenant General Jimmy Doolittle are honored with a parade through Los Angeles and a reception at the Los Angeles Memorial Coliseum before a crowd of over 100,000 people, followed by a tour of the metropolitan Los Angeles area the next day. 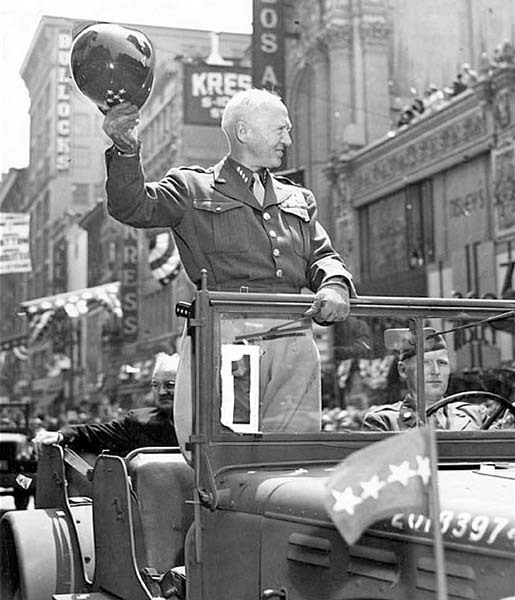 Patton speaks in front of the Burbank City Hall and at the Rose Bowl in Pasadena. He wears his star-filled helmet, chest full of medals and two ivory-handled (not pearl, as is often incorrectly asserted) revolvers. He punctuates his speech with some of the same profanity that he has used with his troops. He speaks about conditions in Europe and the Russian "allies" to the adoring crowds. A largely overlooked moment in history. USSR: 277,380 Soviet and Bulgarian personnel are awarded medals for the capture of Vienna, Austria. CBI - China: Day 2,895 of 2,987 of the 2nd Sino-Japanese War. Day 70 of 91 of the Battle of Zhijiang. US 14th Air Force provides air support. Japanese troops continue pulling out of China. PTO: The USS SEGUNDO sinks two patrol vessels with her deck gun. PTO: US 20th Air Force B-29s bomb the Kawanishi Aircraft Company plant at Narao, the Kawasaki plant at Akashi and the Aichi Atsuta factory. PTO - Alaska: US 11th Air Force B-25s on bombing mission over Araido Island are attacked by Japanese fighters. To evade them, the B-25s fly over Kamchatka where Soviet AA batteries shoot down one, killing its crew, and damaging another which crash lands in Petropavlovsk. This is the first time that Soviet Anti-Aircraft guns hit a US aircraft. PTO - Dutch East Indies: Day 40 of 52 of the Battle of Tarakan Island. PTO - Japan: Japanese Premier Suzuki announces that Japan will fight to the very end rather than accept an unconditional surrender. PTO - Japan: Day 70 of 83 of the Battle of Okinawa. Fighters from USS TICONDEROGA attack targets on Okinawa. PTO - New Guinea: Day 530 of 597 of the Battle of New Britain. US 10th Air Force provides air support. PTO - New Guinea: Day 414 of 481 of the Battle of Western New Guinea. US 10th Air Force provides air support. PTO - Philippines: Day 232 of 299 of the 2nd Battle of the Philippines, aka the Liberation of the Philippines or the Philippines Campaign. PTO - Philippines: Day 177 of 244 of the Battle of Luzon. 5th Air Force provides air support. PTO - Philippines: Day 92 of 159 of the Battle of Mindanao Island. 5th Air Force provides air support. PTO - Philippines: Day 84 of 135 of the Battle of the Visayas region. US 5th and 7th Air Forces provide air support. This collection of General Patton's "one liners" shows how business managers can succeed by applying the combat tested principles of one of America's greatest military leaders. This is the book credited in the opening of the 1970 film Patton. He was, and remains to this day, America's most famous general, representing toughness, focus and the ideal of achievement in the face of overwhelming odds.